Well, that was… interesting. I’m not really sure what I think of that movie. It was definitely unlike anything I have ever seen before. Well, here we go. The Thing, released in 1982, tells the story of a group of scientists in Antarctica who are infiltrated by an alien who can mimic any other biological organism. It kills them off one by one, hoping to get out of Antarctica to civilization where it can multiply and conquer. By the end of the movie, only two people are left alive, and we’re unsure if one of them is still human. (More on that later). The Thing itself is a pretty creepy creature. 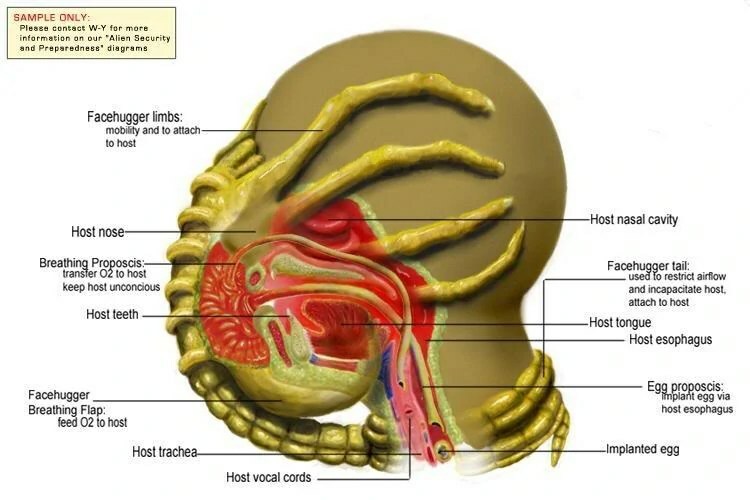 It mimics any organism perfectly, it’s speech patterns, movements, physical body. It was the perfect chameleon. The first time we see it, it is trying to become a dog and it is creepy looking. The only way to kill it is to burn it, destroying all cells in the process. Luckily the scientists had a few flamethrowers just lying around for that. Overall, the monster plays on our natural distrust of others. None of the scientists knew who was infected and that led to a lot of the conflict and death. They turn on each other without a good way to test who is who. I did, however, have issues with the Thing. First, how was it able to have memories of the people it took over. None of that is cellular. It would stand to reason that just by taking over a person’s body would not allow for it to gain all of a person’s memories. But who knows? I also had issue with the fact that these scientists had flamethrowers in Antarctica. What on earth were they going to do with those? Melt some snow? I can understand dynamite, if they were doing any kind of mining or drilling. But I couldn’t get over the convenience of having flamethrowers on hand and ready to go for this alien attack. 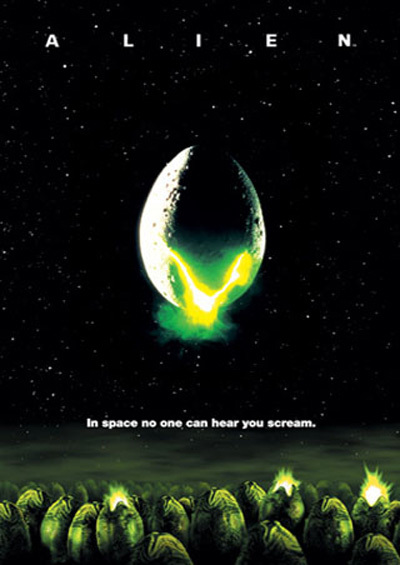 I thought the best part in this movie, as in Alien, was the setting. The isolation and impending freeze certainly added to the creepiness. But that isn’t all that goes into setting for film. The soundtrack is crucial and while I didn’t notice it as much in Alien, I definitely did here. From the beginning there is this suspenseful, creepy music that plays throughout the film. It definitely told you that bad things were going to happen and soon, setting the mood. The final issue for me was the ending. It was a bit ambiguous. MacReady and Childs are sitting in the snow, watching the entire complex burn to the ground and sharing some whiskey. Kind of a sad ending, as they are going to freeze to death in the snow now. However, we are left wondering if Childs is actually one of the aliens. He was missing from the entire final confrontation scene. He could easily have been taken over. The alien’s plan was to get frozen anyways. This could be the way it was accomplishing that goal. But I guess we will never know. So I had a really hard time reading this novel. I just had so many mixed feelings through the beginning about how things were going. But there were some redeeming qualities that Maberry used to his advantage that I will outline a bit later. Before I start though, I want to acknowledge that this is an adaptation of a movie as opposed to the other way around and that may have something to do with the problems I found in this novel. To start with, this was such a slow book for the first 100 or so pages. It felt much more like I was reading a mystery novel as opposed to a monster novel. In fact, if I didn’t know that a werewolf had killed Ben in the prologue, I would have said he could have been murdered by a madman and Lawrence was just investigating on his own. It really just didn’t work as well for me. It was too slow and I understand that the werewolf only changes on the full moon but maybe there could have been a bit more excitement. We learn a lot about Lawrence as a character and his relationship with his father, but I don’t know, it just wasn’t happening fast enough for me. That being said, the last 200 pages seemed to fly by for me. We first see the werewolf and things just go from bad to worse for Lawrence. I felt like the beginning could have been cut in half and it would have helped me a lot. The monsters in this novel were definitely the two werewolves. The first time we see the werewolf in the gypsy camp was awesome. You get this figure, eight feet of fur and claws and teeth, standing up before Lawrence, and then carnage ensues. This creature is a force of pure anger and malice and rampage. We saw this early this semester with Rawhead Rex but unlike the ancient god, the werewolf has no logical reasoning. It is an animal of pure instinct and power. It attacks and attacks without thought of why or how or who he was before. That is where the horror lies, at least for me. The loss of the self and the knowledge of right and wrong. The chance that I could hurt someone unwillingly and then have to deal with that loss afterwards. However, I would agree with what one of my fellow classmates pointed out about not having someone to root for when Lawrence turns into the werewolf. The Lawrence that we have come to connect with disappears and we can just sit back and witness what happens without any hope of preventing it. But it worked to show me the same feeling that Lawrence has after being buried underneath the consciousness of the Wolfman. Having never seen the movie, I cannot compare the adaptation. I would hope that it isn’t as slow as the book is to start, but I will have to wait and see once I’ve watched it. I really liked reading World War Z. This novel was completely different than anything I had ever read before in horror fiction, or any other genre for that matter. The premise for the novel is that this is a collection of interviews from people all over the world about their experiences during the zombie apocalypse. So, while we don’t really know much about the man doing the interviewing, that’s okay. We are told the story of this long war by stringing together all of these smaller short stories. And while we weren’t given one main character, we are still invested in the novel as a whole because our protagonist is not one person but all of humanity and that worked for me. The depictions of these zombies were definitely what I would call true zombies. The slow, rambling dead that use their sheer numbers to overwhelm their prey. If you are bit, you turn into one of them. You have to sever the nervous system to kill them. All of these traits are what I think of when I think zombies. Not the craziness that we see in modern representations of fast movie zombies that you can kill with a bullet to the chest. No. True zombies. And I appreciated that. And in this instance the zombies were monstrous because they are everywhere. We’re not focused on one character in a house or something. We don’t have the hope that if we can just escape, then we’ll find somewhere where there are no zombies. These zombies are everywhere and that is what gives them the most horror. No matter how far you run, except Antarctica, there will be zombies. And they will keep coming whether you are awake or asleep. And the fact that if you kill one of them there will be one less but if they kill one of you, there will be one more of them is a horrible way to fight a war. I could go on and on about the things that I liked in this book and that were done well but I feel like I should talk about some thing that didn’t work. For me, it got really long about midway through the book. It just seemed to keep going on and on about similar experiences with no end in sight. This made it very tedious to read. However, I understand why it was done like that. This war seemed to be going on and on for those trying to survive. They were going day by day with no end in sight. So in a way, it made sense for it to get a little laborious to read. It definitely connected me a bit more. Aesthetically though, I could have used it going a bit quicker. So what was my favorite interview in the novel? Definitely the interview with Darnell Hackworth. This interview comes at the end and is about the K-9 units used during the war. They trained dogs to scout out areas and to lure zombies into combat on the military’s terms. While there were certainly casualties, which was said to hear about, this unit was pretty successful. And that came from the amount of specialization that the dogs had. Larger dogs, like rottweilers and mastiffs, were used as body guards and fighters not only against zombies but also against rabid dogs. Smaller dogs, like dachshunds and minpins were used as the scouts in urban areas because they could fit through all the tight spaces. It was really interesting just imagining these dogs working in tandem to effectively complete missions. I just thought it was cool. If it wasn’t obvious already, I really enjoyed this book. Because of its unique writing style, I am hesitant to watch the movie that recently came out. If anyone reads this and has seen the movie, I would appreciate some reviews of the movie and a yay or nay on whether or not to watch it. 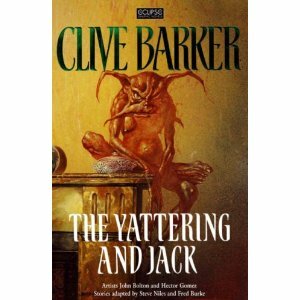 Clive Barker’s story “The Yattering and Jack” is definitely one of the more interesting stories we have read so far. It had its own set of problems but still was able to remain quite interesting and funny. This is the story of the Yattering, a lower demon from Hell, and his attempt to corrupt Jack’s soul. But Jack takes everything that the Yattering does and chalks it up to some logical explanation, be that dogs or a settling foundation. Nothing seems to bother him, until the end when we are told he was just playing along but we’ll get to that a little later. what he looks like until the end but I definitely imagined this little red imp dude, mainly because he was a lower demon and red is often associated with Hell. Imagine my surprise when I saw this cover art. Pretty much what I had imagined. Now, for a couple issues that didn’t work in the story for me. One was the head hopping that started happening as soon as Jack started playing a larger role. When the confrontation between the two starts to happen, we are jumping back and forth on each one’s feelings and it started to get confusing, especially with the use of “he” pronouns. I had trouble at first understanding which mind we were in from paragraph to paragraph, especially when the bomb is dropped that Jack knows about the Yattering and knows how to defeat him. And that’s a whole other issue in and of itself. How did Jack know about the Yattering and find out all of this information? It came out of nowhere and seemed really abrupt, which worked as a surprise for the Yattering but confused me, but I digress. The head hopping just didn’t work for me. It happened too often and too confusingly. The ending was really great, using the che sera sera to tie everything up and bring the story full circle. It got my stamp of approval. Overall, I enjoyed the short story and would recommend others to read it. Also, just for fun, there is an episode of Tales from the Darkside on The Yattering and Jack. It’s Season 4, Episode 7. It’s quirky and starts on Christmas Day but a fun little episode to watch. Oh, and it stars Phil Fondacaro as the Yattering, which was by far the worst possible interpretation I could think of.